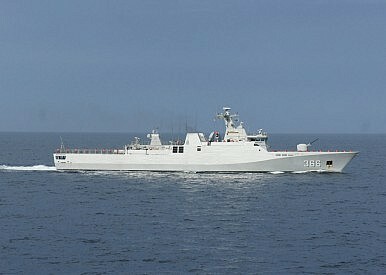 The Indonesian Navy corvette KRI Sultan Hasanuddin 366 pictured in 2014. Jakarta likely to issue statement on much-anticipated Philippines v. China verdict. Indonesia will likely issue a response after an upcoming verdict on the Philippines’ arbitration case against China on the South China Sea, the country’s deputy coordinating minister for maritime affairs told a forum in Washington, D.C. on Wednesday. Indonesia continues to insist that it is not a claimant in the South China Sea, though Beijing’s nine-dashed line does overlap with the surrounding waters of the resource-rich Natuna Islands. Jakarta has publicly said that the nine-dashed line claim is not in line with the United Nations Convention on the Law of the Sea (UNCLOS) (See: “Indonesia’s South China Sea Policy: A Delicate Equilibrium”). The country’s position has recently come under scrutiny following an incident where a Chinese coast guard ship attempted to intercept an Indonesian crackdown on a Chinese boat for illegal fishing, sparking unprecedented rage from Jakarta (See: “Will Indonesia’s South China Sea Policy Change Amid China’s Assertiveness”). But asked whether he could see Indonesia – or, more broadly, ASEAN – issuing a public statement of support calling for all parties to abide by the United Nations Permanent Court of Arbitration (PCA) verdict expected in May or June, Arif Havas Oegroseno, Indonesia’s deputy coordinating minister for maritime affairs, said that Jakarta would certainly have a position on the ruling. “Whether or not ASEAN will have a statement on that I don’t know. But Indonesia will certainly have a position on that,” he said following his remarks at an event organized by the Asia Foundation. Oegresono, a distinguished diplomat who previously served as Indonesia’s ambassador to Belgium, Luxembourg, and the European Union and president of the 20th Meeting of the States Parties of UNCLOS in 1982, did not elaborate further on exactly what that position would entail. China, for its part, has already said that it will ignore the ruling. Apart from Oegroseno’s comment on whether Indonesia might issue a statement of some sort, other Indonesian ministers have recently sent confusing messages about what Jakarta might do in the legal realm. For instance, after meeting Chinese embassy officials to discuss the incident in the Natunas earlier this month, Indonesia’s fisheries minister Susi Pudjiastuti told reporters that Indonesia may take the issue to the International Tribunal for the Law of the Sea, a move that would both undermine the country’s long-held position as a non-claimant state hesitant to legitimize Chinese claims and have limited utility. Speculating in a personal capacity about what the court would decide, Oegroseno said that it may not specifically say that China’s nine-dashed line is invalid and would more likely limit its ruling to specific issues such as how claims should be made, the entitlements of specific features, and the admissibility of certain forms of evidence like maps. “I’m not sure they will say that the nine-dash line is invalid,” he said. Nonetheless, Oegroseno, who played a role in negotiations surrounding a decades-long maritime boundary dispute between Indonesia and the Philippines, which was settled in 2014, said that those specific decisions could have effects for how other countries in the region resolve such disputes. “If they do define that for countries, countries – not only Indonesia – can use this as [an] element in our bilateral negotiations,” he said. Though he did not elaborate, Indonesia itself has outstanding disputes with several countries including Malaysia. More broadly, Oegroseno stressed that the ruling should underscore the importance of resorting to peaceful means to settle disputes instead of coercion, a veiled reference to China which has employed force in several cases in the South China Sea, including in the seizure of Scarborough Shoal from the Philippines in 2012 as well as the placement of an oil rig in Vietnamese waters in 2014. “The takeaway from the PCA is that we need to employ peaceful means to settle disputes,” he said. He added that a number of Southeast Asian states have already demonstrated their willingness to do so, including Indonesia and Malaysia in the Ligitan and Sipadan case in 2002 – a case which Jakarta lost – and Malaysia and Singapore in the Pedra Branca case in 2008, which were both taken to the International Court of Justice. “When we have problems, I think it is very good for us to go to a third party or a negotiation and not use force or threat of use of force. I think that is the most important element,” Oegroseno said.